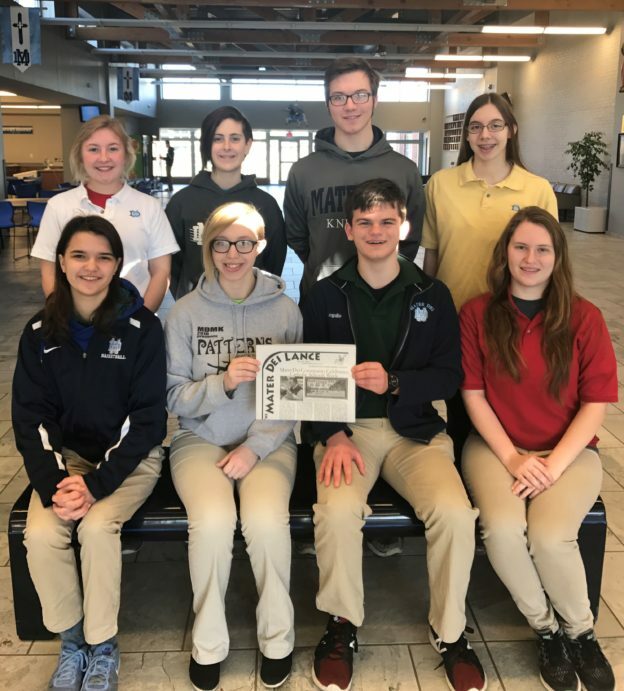 Pictured after earning a Blue Banner Award at the 2017 SISPA Convention are “The Lance” newspaper editors (front, left to right) Katya Hoffmann, Amber Litteken, Ben Logullo and Sarah Maller; (back, left to right) Kendall Bowman, Ellie Stark, John Hund and Anna Klostermann. At the 2017 Southern Illinois School Press Association (SISPA) Convention held on February 22 at Southern Illinois University Carbondale, The Lance newspaper earned the Blue Banner Award, recognizing overall excellence for the October 2016 and December 2016 issues. The 2016-2017 editors are Amber Litteken (Editor-in-chief and editorial page), Sarah Maller (Editor-in-Chief and picture page), Kendall Bowman and Katya Hoffmann (sports page), John Hund (front page), Ben Logullo (features), and Anna Klostermann and Ellie Stark (club news). Mrs. Donna Goetz serves as moderator for the newspaper.